Although you and your employees want to get the job done as quickly as possible, safety is the key to protecting everyone involved. As exciting as starting any service business is, it can require a lot of planning and preparation to ensure safety. Working in any service industry can involve many potential hazards – whether it be slip and falls, potential air pollutants or just general hazards. While performing specific tasks, ensure your employees wear protective gear. Whether it be cleaning out duct vents, waxing floors or performing general janitorial duties, all necessary protective equipment should be required for you and your employees. Masks, gloves and goggles can protect employees from potential harm of chemicals used for cleaning and particles that fall from areas being cleaned. Even simple tasks, such as dusting vents, can lead to illness if the client doesn’t maintain their HVAC systems. Some industrial and critical care cleaning products require wearing protective equipment so employees don’t harm themselves. Along with protecting your employees, it’s pertinent to protect clients and their employees. Ensure your employees use necessary equipment, such as signs and tape to block areas that could be potentially hazardous to anyone. Even quickly mopping a floor or cleaning bathroom stalls can create a hazard if the client’s employees are working while you’re doing the type of service. Some clients may require your services during working hours – make sure you and your employees take the necessary precautions to avoid any incidents. Whenever it’s possible, have at least one employee protect the area you’re working in. If your client or their employees attempt to come into the area, warn the client it’s not safe to be in the area while the work is being done. In many cases, caution signs don’t stop clients or their employees from entering the area. In certain circumstances, it’s almost impossible to avoid these situations, but having someone there to ensure everyone’s safety is helpful. Your clients may also assist you so it doesn’t compromise there businesses or cause any potential loses on their part. For any tasks that may ensue hazardous conditions, always alert customers of the work being done, and what’s best to keep them safe. With today’s technology, you can type a simple email and allow your client to cut and paste it in an email to alert their employees of work being done that may cause someone to get hurt if they interfere. Include the potential hazards in your information for the client and their employees. Like you and your employees, your clients have work to be done to be a successful business. Clients or their employees may not consider the work you’re doing to cause any potential hazards. They have deadlines to meet and might consider the work you’re doing. If you ensure everyone is told the dates, time involved and details about the work you’re doing, it can help your business if anyone does get hurt while the work is being performed. Performing tasks may require working during times when offices, industrial facilities and other clients have no employees or customers are in the building. This can require working overnight or during non-business hours. Working with a client that has staff working 24 hours also requires alerting customers regarding the work you and your staff are going to do. Some clients don’t consider the consequences, because they don’t understand your business’s requirements for bonding and insurance purposes. If any project must be done while the business’s employees are there, attempt to do the project in sections. Block off the area you’re working in until the work is completed. Move to the next section and block off that area. Talk to the client about how the work is going to be done and allow them to give suggestions on the best approach to ensure safety the safety of their employees. Don’t allow clients to avoid the potential consequences. Although they have a busy business themselves, the should also be involved. Safety is important for them and your employees, no matter what type of service business you have. Plan ahead of time to make the job easier — whether it’s a one-time project or on-going. Purchase all the equipment, supplies and signs you need at Worldwide Janitor to make the services you provide are safe, but also make your clients happy. 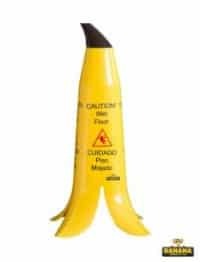 This entry was posted in FAQ's, General Cleaning, Safety, Uncategorized and tagged Disposable Gloves, wet floor cone. Bookmark the permalink.